I found this collectible Tea Time Barbie on Ebay. She and her Lil Bear and Cozy Bunny are having their special tea party at my house now! I think I will join the party this afternoon with a cup of Darjeeling. Won't you join us? What is your choice of tea for afternoon tea time? Cute .... I soooo am hoping for a granddaughter someday. I have 3 little grandsons at the moment, but my son will soon be proposing to his girlfriend so hopefully in the near future ..... :-) Here at the office, I tend to have Earl Grey or (as is usually the case) Lady Grey tea in the afternoon. My 2-3 cups of tea in the morning is always black tea taken with milk. 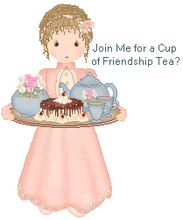 Clara had it on her blog and I looked it up and it is a must for tea lovers. I love this Barbie! I'll get one and they can be friends! Wow! they think of everything! oOOOH - I want to come over to your house and play Barbies! I might just have to sneak this one out of the box ;-) Too cute!